Turns out that no matter how far you travel, you discover that human beings have a lot more in common than different. We need the same basic things; food, shelter, water (hopefully clean water) . We must find ways to take care of ourselves, and we want to take care of our families and children. It seems that the need for human touch and community is also strong. This past July, on a Changers of Commerce trip to Ethiopia, we spent some time in an Elder Center in Dire Dawa, one of the poorest cities, in one of the poorest countries in the world. Here each day, the senior citizens of Dire Dawa would gather – for some time together, a lesson from the center director, and a meal – if you call a bag of ramen noodles and a piece of fruit a meal. Maybe their only meal. Once we adjusted to the squalor and the realities of their harsh lives, we quickly focused on what we have in common, and how we could connect and maybe make a differnce. These are magnificent people. They have so much dignity, bearing and in most cases genuine warmth and optimism. A few stole our hearts. Bazunesh, the woman in the picture below, is a single mom with two daughters. Her husband died of aids. 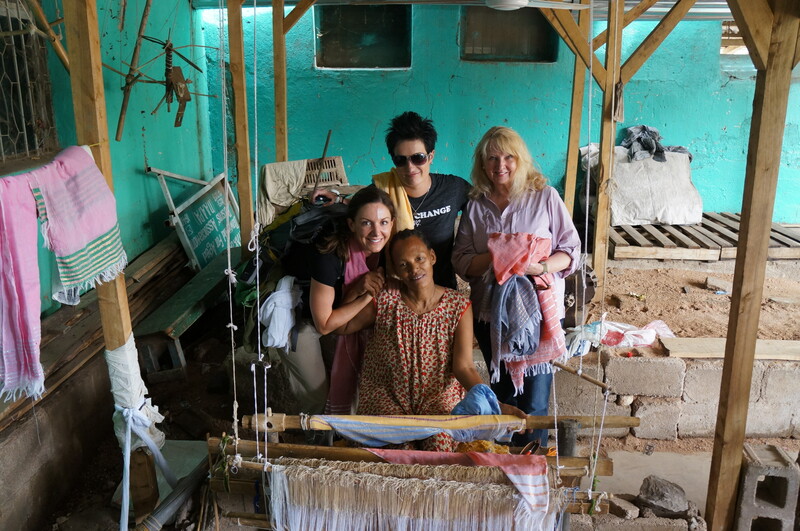 The Elder Center purchased an old broken down loom for her, and everyday she works to make scarves for sale. It is her only source of income, and it is difficult to find someone to buy them – unless a group like us comes by. We bought all of them, we are buying more, and we are going to sell them this fall at the People, Profits, Planet conference in Dallas. The money will go to Global Hope Network International, to Bazunesh and her girls, and to the Elder Center. Stay tuned for how you can purchase one in the fall, or make a donation today of more than $100.00 and be entered to win one of the first ones. You will know that you are truly changing lives. I first saw this picture while the tribe was in Ethiopia on a Changers of Commerce trip – and I was drawn to it – and Bazunesh’s story for so very many reasons. Additionally, I have fond memories of spending time with my grandpa as he wove items on his loom (mainly placemats, napkins and coasters) to raise money for charities at his retirement center. Needless to say, I was tickled to win one of Bazunesh’s scarves during the BTC Ethiopia tweet-a-thon fundraiser. It was like a full circle coming back around. Thank you for giving me the opportunity to #bethechange! You guys are totally amazing! We can’t all go out and be in the amazon places you visit, and be the change first hand, but through your efforts, stories and ideas you bring I all ways that we can help be the change! Bring the scarves home cause you know we can use them – what an amazing idea! Thank you for sharing the journey and giving us all ways to help out!